PC Shredder 1.1 is here! Download it now, it's free. PC Shredder is one free data removal and file shredder software, can permanently delete files, folders and make them irrecoverable, completely shredding the files you specify, make it impossible for anyone to restore deleted information! Prevent your business data, important documents and personal information from being recovered. PC Shredder is Freeware. It is free for both personal and commercial use. PC Shredder works on Windows NT, Windows 2000, Windows XP, Windows 2003 Server and Windows Vista. There is no minimum hardware requirement for PC Shredder to run properly. When you delete files from a disk on your computer, Windows does not erase the contents of these files from the disk - it only deletes 'references' to these files from files system tables. The contents of all deleted files remain on the disk and can be easily restored using any recovery utility. After you delete the data, Windows deletes the data but not completely. After deleting the file, its name is only erased from the database whereas all the contents remain there. This way data don't get deleted completely. Here is the solution for your concern. Don't let your PC be unfaithful to you. Use PC Shredder to keep your PC secure and faithful. PC Shredder allows you easily wipe free space to ensure that previously 'deleted' files cannot be recovered. 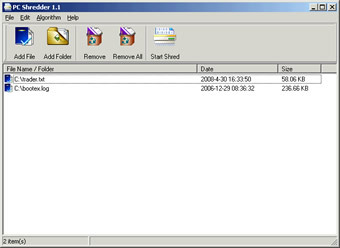 PC Shredder uses 5 built-in delete files algorithms for overwriting files content to leave no chances to recover them. If you use Windows Vista, we recommend you run Delete Files Permanently as administrator so you have permissions to delete all necessary files, wipe Free Space. If you use Windows XP/2003/2000/ME, make sure you have administrative privileges. If you use anti-virus scanner that checks saved to disk files, it could slow files wiping as anti-virus scanner checks files after each overwriting/verification pass.